“Maija is a true gem,” a faculty member said. Indeed, her face was a beam of light and her eyes seemed to sparkle when she smiled, which was often. But there was a sincere, committed side to Maija that made her the heart and soul of her class at Pine Hill and a leader at High Mowing. Harmony and cooperation among her peers was of great concern to her as was the preservation of all she valued about the special nature of High Mowing. She read Mrs. Emmett’s memoir, “From Farm to School,” from cover to cover and crusaded to ensure that the spirit of Mrs. Emmett’s ideas would prevail. 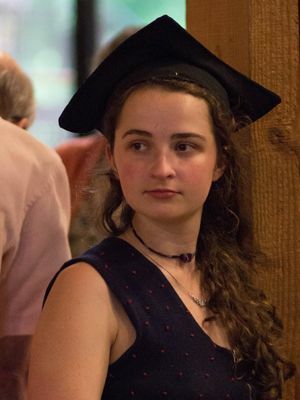 Maija received one of two Gordon Russell Scholarships for her interest in the environment and the natural world; an honor that reflects her deep involvement with the Naturalist program and an awareness of her place in the natural world. For her senior capstone, Maija used natural materials and hand tools to craft a beautiful set of personal articles –everything needed to sustain daily life in the wilderness. Maiji plans to continue a course of emergency wilderness response training that she has already begun, the first level of which she easily mastered.